As I’ve mentioned in the past, classical music marketing and advertising can be a thankless job. If you think it’s easy, you try finding something new to say about music that’s been around for hundreds of years. Go ahead, I’ll wait. . . . See? Not exactly a piece of cake. No one likes doing the same old thing, but I can’t really hold it against those organizations that fall back onto the two most popular ways to build interest and excitement about your typical orchestral concert: hype the warhorse and/or hype the big-name personality, usually with one or more exclamation points: Beethoven’s 5th!! YO-YO MA!!! Obscure programming creates a tougher challenge, but also provides an opportunity to be more creative. 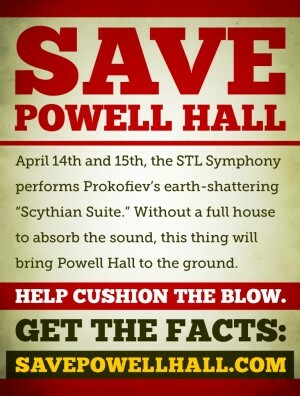 And by far, the best orchestral marketing and advertising effort I’ve seen lately — probably ever — is St. Louis Symphony’s “Save Powell Hall” campaign. Take a deep breath and relax. There is nothing actually wrong with the orchestra’s historic home — the campaign aims to create buzz for this coming weekend’s performance of Prokofiev’s Scythian Suite. It is attention-grabbing, clever, and multi-faceted, brilliant in concept and perfectly tongue-in-cheek in execution. But has it been effective? Given the alarmist nature of the tagline, has there been any negative backlash? A campaign this good demanded more attention, so I spent some time chatting with Jonna Robertson, Vice President of Marketing for SLSO, to get those questions answered and to find out more about the campaign. Every weekend in the SLSO’s season has a dedicated marketing campaign which typically focuses on a familiar piece or notable soloist. They put more resources behind their “special” concerts featuring music by John Williams, and something of that scale was due for a regular subscription weekend. Two years ago, the New York Philharmonic used some YouTube videos starring Music Director Alan Gilbert to create buzz about performances of Ligeti’s Le Grande Macabre. Last November, the Baltimore Symphony tried something similar with their “Who is Joan?” campaign to promote performances of Jeanne d’Arc au Bücher (“Joan of Arc at the Stake”), Arthur Honegger’s oratorio. Not to mention rarely performed music. The campaign’s landing page gives a wink and a nod to the three previous times the SLSO has performed Scythian Suite, the most recent of which was over thirty years ago. “I worked for a number of years with the Chicago Symphony and despite attending many concerts, I had never heard it performed live,” Ms. Robertson admitted, until a 2007 performance by the CSO and Alan Gilbert. That may be the case, but Ms. Robertson admitted that the tone of the campaign and $22 price point combined with some of their atypical media placements — posters in metro/transit stations near schools and so-called “wild postings” on places like boarded up storefronts — were more likely to reach 20-somethings than the blue-hairs that traditionally form the patron base of any orchestra. So how would this play to those within the second oldest orchestra in the country, one with over 130 years of tradition in a stout Midwestern city? What was the reaction within the organization when she presented the campaign? One of the musicians did correct her on one important item: during her presentation to them, she mentioned off-hand that the orchestra had never recorded the work. After finishing, she was approached by Tom Drake, the orchestra’s Acting Principal Trumpet. “Tom said very politely, but directly, ‘You’re wrong. We have recorded it.’ He eventually brought in an LP he had in his collection that turned out to be 1977 re-release of a recording the SLSO had done a number of years prior.” A picture of Mr. Drake’s copy of that album now appears on savepowellhall.com. There were also some preventative measures taken outside the orchestra. “Before we launched, we made a point of calling key people in the community to let them know what we had planned.” I can imagine that it was a good move. No sense having the Mayor thinking that the orchestra’s home was at risk of facing a literal wrecking ball, not a musical one. That seemed to do the trick, and no complaints have been filed by any prominent local dignitaries. The praise is nice, but without a comparable rise in ticket sales, this would all be a glorified PR exercise. Final results won’t be known until after the concerts this coming weekend, but as of about a week ago, so far, so good. “Early ticket sales are tracking one-third to one-half better — significantly better — than the usual concert,” according to Ms. Robertson. Tags: Alex Ross, Jonna Robertson, Marketing, Sarah Fitzharding, Save Powell Hall, St. Louis Symphony, UPBrand Collaborative. Bookmark the permalink. True, and what I said was that I worked there for years and had not heard it UNTIL Alan Gilbert conducted it. Thanks for clariying, Jonna. That wasn’t clear in my notes, but I’ve edited it accordingly above. I really have to commend the SLSO on their improved communication efforts to renew my interest with great programming and top-notch talent over the last couple of years. This campaign was a great concept and I hope it gets some new folks through the doors to experience the amazing Powell Hall and our local orchestra – but I have major beef with your praise of the “wild postings” implemented to target twenty-somethings. These posters were installed without permission on abandoned buildings and still remain crumbling on some vacant buildings. The wheat paste used to adhere them left residue that still remains on the Arcade downtown – even though they were removed almost immediately. The Del Taco on McCausland looked bad enough but the Save Powell Hall posters remain slowly deteriorating on its sad facade that once helped sober up a lot of drunk twenty-somethings. I’m going Saturday because the SLSO has me excited to experience classical music again with their concerts in Forest Park, great programs and their saavy use of social media NOT because of this campaign. If SLSO reads this, please don’t make the same mistake. Respect property owners and please clean up after yourselves. Pingback: SHOWCASE: STL SYMPHONY SAVE POWELL HALL CAMPAIGN | Hello. We're UPBrand.